All purchases within 150 miles of our showroom and manufacturing facility in New Brunswick, New Jersey are automatically reviewed for Delivery. See the map, below, generally, all of New Jersey, New York City, most of Long Island, the Hudson Valley, parts of Connecticut, and eastern Pennsylvania, qualify. Upon completion of your order, our Delivery Department will reach out to you via email with a tentative delivery date and two-hour time window. All of our deliveries are grouped by geographic area, which allows us to accomplish the greatest number of deliveries in the least amount of time with the smallest ecological footprint. As a courtesy, we will call 30 minutes prior to arrival. Our White Glove Service includes delivery of your mattress, topper, furniture, or and soft goods. We will unroll and lay your mattress on the frame, removing and disposing of all packaging. If your purchase includes furniture, we assemble your frame. There is an additional $35 fee for the removal of your existing mattress, which must be paid prior to the delivery. The mattress or piece of furniture removed from your home will be disposed on premises in designated area, such as garbage. 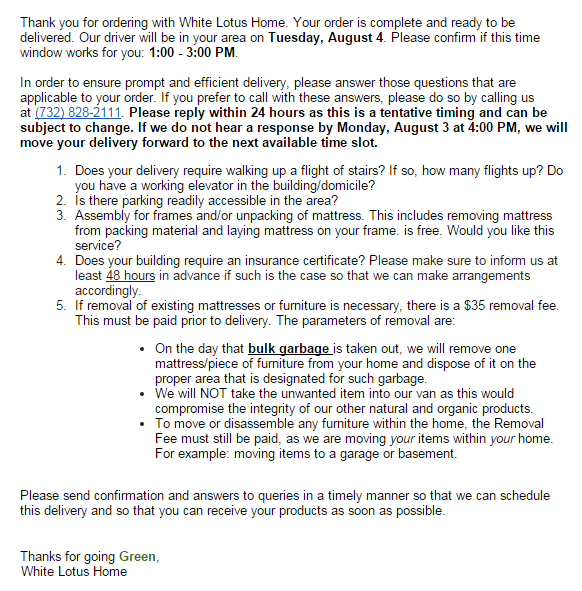 The Removal Fee must also be paid for White Lotus Home to move items within your residence. For instance, if we move to a garage or basement. We cannot take your unwanted mattress or furniture away in our van, as this may compromise the integrity of our other natural products. Please note that all deliveries are accomplished at our discretion. Qualification for delivery is dependent upon the order size, distance from manufacturing facility, availability of our driver, and other delivery schedules. As a courtesy, we will call 30 minutes prior to arrival. If we experience any delay due to inclement weather, traffic, or other circumstances, our driver will be in contact with you. If there is any cancellation of a scheduled delivery, we would appreciate one-day advance. We can always leave purchases with a doorman upon your written request. Questions? Comments? Call us at (732)-828-2111 or email sales@whitelotushome.com.